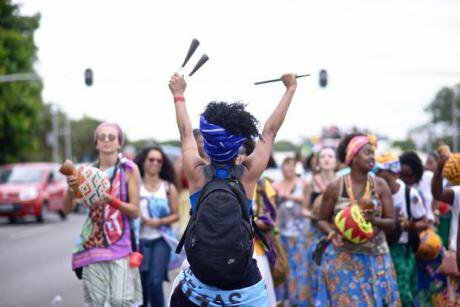 The Black Women’s March in Brasilia, 2015. Photo: Sabriya Simon. Some rights reserved.The feminist movement has a race problem. This is nothing new – in fact, the problem has been there since the movement began. The racism of white women, whether it is overt or covert, actively contributes to oppression experienced by women of colour. That racism also undermines the efforts of feminist struggle by upholding white supremacist capitalist heteropatriarchy. For some white women, the benefits of white privilege seem to outweigh the gains to be made through dismantling the hierarchies at the root of widespread social inequalities. And those white feminists who have made no conscious effort to unlearn their own racism will find that it manifests itself within their feminism not randomly, but as an organic product of their beliefs. Writers considered pioneers of feminist thought, including American activists Kate Millett and Betty Friedan, are also responsible for a pattern of universalising white women’s experiences. Positioning whiteness as the ‘standard’ of womanhood obscures the realities lived by women of colour, and the role of hierarchies beyond gender in shaping female experience. Feminism is a social movement devoted to liberating all women and girls from structural oppression. And yet, within the mainstream of this movement, the liberation of some women is treated as a higher priority than that of others. When feminism prioritises the interests of white, middle-class women over those of their more marginal sisters, it only replicates the after-the-revolution mentality that has historically been used to sideline women within progressive politics. When gender is positioned as the main hierarchy for all women to overcome, a strange sort of trickle-down liberation logic is applied to justify how racism, classism, ableism, and lesbophobia are overlooked. Ignoring a form of oppression that shapes the lives of countless women simply because you do not experience it doesn’t resemble sisterhood, not by any stretch of imagination – yet this is a standard excuse given for disregarding the political issues facing women of colour. We are told that talking about race divides the feminist movement, that it jeopardises solidarity between women. But valuing white women’s comfort over women of colour’s liberation is the antithesis of sisterhood. The expectation that women of colour remain silent about our experiences of racism, for the convenience of white women, removes the possibility of sisterhood. The expectation that women of colour devote our energies to helping white women attain socioeconomic parity with white men – the entitlement behind that assumption! – makes interracial solidarity unlikelier still. Yet such solidarity can exist. I know this first-hand. I have experienced sisterhood with white women and value those connections. That being said, I will never condemn a woman of colour who says otherwise – the racism of white women means that mixed feminist spaces can be a minefield to navigate. For this situation to improve, for interracial solidarity between women to become not an exception but the rule within feminist spaces, a great deal must change. Fortunately, there is no greater vehicle for change than the feminist movement. Altering the dynamic of race within the feminist movement demands critical self-reflection, persistent effort, and white women’s willingness to break with old patterns of behaviour. Every good liberal is fed the message that nobody should see race – but not seeing race means not seeing racism, and being blind to racism precludes the possibility of identifying or challenging it. White women must acknowledge the differences in experience brought about by race if they are ever to have a meaningful understanding of women of colour’s lives. It is such a fundamental thing, so obvious it almost doesn’t bear saying, but white women also need to acknowledge women of colour as human beings who have thoughts and – too often neglected in discussions of race – feelings. Race isn’t an abstract conversation for us. It has very real implications and consequences. Empathy is crucial. We often talk about how misogyny makes women vulnerable, but the reality that women of colour are in an even more vulnerable position – thanks to what Frances Beale described as a 'double jeopardy' of racism and sexism – is not always given due consideration. White women who want to share trust and solidarity with women of colour need to consider how they conceptualise us – are we your sisters, or are we tokens? Are we necessary agents of feminist struggle, or a pat on the back for diversity? Honest, inward reflection is essential. I invite every white feminist to analyse how she thinks of us, critically evaluate why that might be, and work from there. None of this is easy or comfortable – but nobody ever said the politics of liberation would be. Claire Heuchan is speaking on Saturday, 14 October at the FiLiA feminist conference in London.